As a marketer, I prefer using Google.com as my primary search engine for many reasons. Sometimes I want US based searches but primarily it is because often Google tests or releases features on .com first. And if I ever need to do local-based searches, I can easily head to my country specific Google version instead. 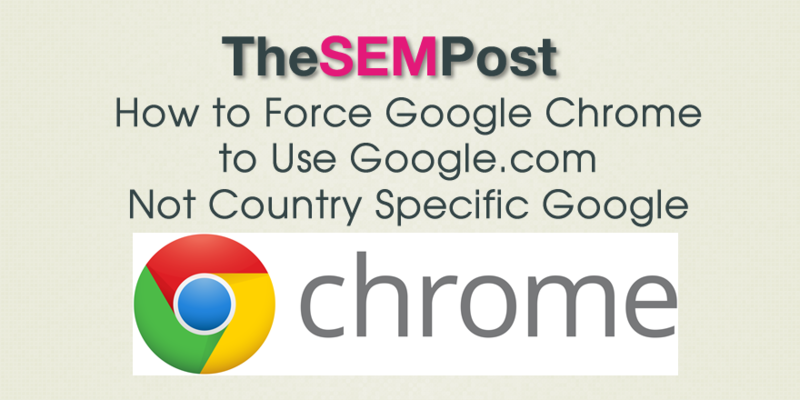 There is a way to set Google.com as the default in Chrome, for marketers wishing to keep an eye on the Google.com search results instead of their own country version. First, in Chrome, go to settings then click “Manage search engines”, even if it currently shows Google as the default. Then scroll all the way to the bottom until you see the “Add a new search engine” box. For search engine name, type “Google NCR” and for keyword type “Google NCR_” – this will serve to remind you that this is the Google search with “No Country Redirect” enabled, although you can name it whatever you’d like. I’d avoid naming it just “Google” to prevent confusion. Be sure it is exactly as above, including all parameters. Add it, save as default search engine, then set this new Google NCR as the default search engine. And now when you search with Google Chrome using the address/search bar, it will always search using Google.com without the country redirect. Do note that your local search results may be skewed by using Google.com although the AdWords ads displayed will still be geotargeted to your location, which is working as intended. If you want to see AdWords ads for another country, you would need to use a proxy or VPN to do so. But now it is by default. Thanks for this article, it was very useful. I travel a lot and I get quite annoyed by what I call “forced localization”. As a software engineer I don’t get one thing: why aren’t users simply asked: would like to use: a) a local version or b) the US version? Do you know how to do this for the Chrome Android app? At present, when I enter Google.com, it redirects to my country’s Google webpage. thank you! I knew there should be a simple way – all the other blog articles on this topic were way too convoluted (involved editing chrome resource files… blegh). This stopped working last December… you do get the URL as google.com but it redirects you to your country’s page anyway. It still works for those whose countries aren’t under the Right to be Forgotten in the EU.